150km SE of Melbourne. Near Venus Bay. Drive almost to Venus Bay via the South Gippsland Highway and follow the signs to Cape Liptrap. Takeoff is the second bowl from the lighthouse. Access to the launch is via a walking track 200 meters before the lighthouse car park. No parking along the road, you must park at the car park. Launch is roughly 500 meters away from the start of the track. A beautiful coastal soaring site consisting of five large bowls and approximately 11km of low sand dunes. The five bowls cover a distance of about 3km. 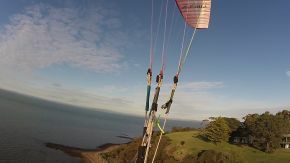 Launch is ideal for paragliding and adequate for hang gliders although not really steep enough. In a firm wind, launch is no problem. Rounded ground ramp cliff top. Top landing only. Large 60m x 20m cleared area to the left of takeoff. From the air the landing area is clearly visible, do not fly beyond the roadway/powerline, you may find penetration difficult and undershoot into the tea trees. Do not fly at Cape Liptrap alone. The site is relatively remote and has few visitors. There is little or no mobile phone reception. Only fly this site in winds strong enough to stay up due to the lack of bottom landings. If the wind shifts to the west or south the points create turbulence. The bowl adjacent to the lighthouse faces SSW, the remainder of the coast faces SW. It is a long walk out if you bomb out on the beaches to the north. 100km SE of Melbourne. 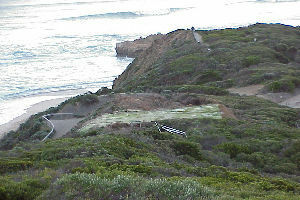 Launch from the old railway embankment, east of the township and west of the graveyard or launch from the dunes east of the graveyard (a 100m walk in). Vicroads Map 95 J10. 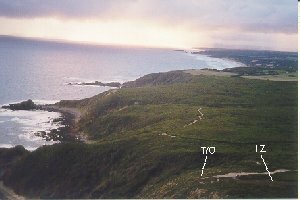 The Graveyard site consists of dunes on the stretch of coast between the town of Kilcunda and Cape Patterson, and is suitable for STUDENT rated pilots upwards. It may be soared, and offers a glide for learners when the tide is out. 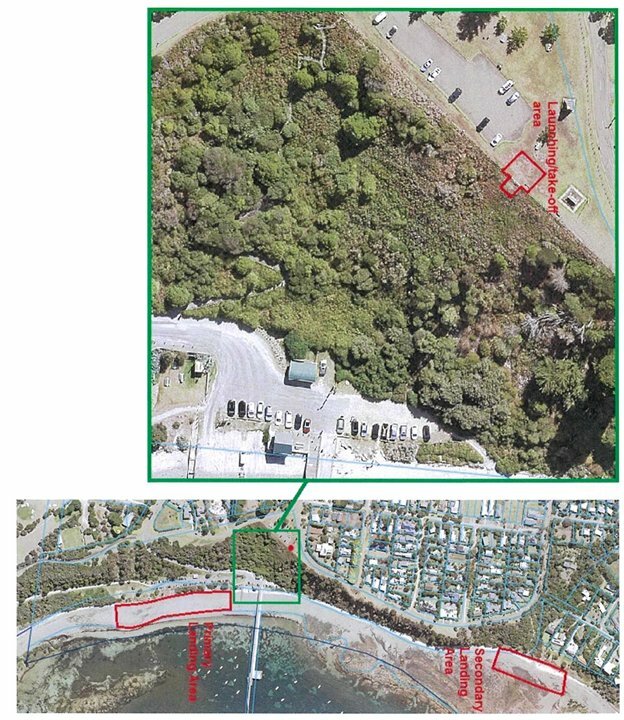 In June 2009, Launching from the disused railway embankment within the coastal reserve close to town has been temporarily prohibited for use by Parks Victoria and VHPA. In lighter winds, the dune takeoff at the Graveyard (on west side of the path in to the beach) is preferred for hang gliders, as the embankment take off further west around the rocky point is quite low and is suitable only for stronger winds. The dune face is broken and uneven further to the East, but there's a good high soarable dune face about 400m long at the Graveyard takeoff. In a good wind (15kts), it is eminently soarable, but beware - this site has claimed a life in light winds when scratching the low dunes. No flying past the point right of launch, to Trestle bridge, August to April, because of Plovers nesting there. The takeoff at the Graveyard is directly above a popular surf fishing spot, so beware of people and fishing equipment on the beach when landing. The Graveyard launch does have a limited takeoff run. It has become very overgrown, so watch out for undergrowth snagging the hang glider control bar on the takeoff run. Paraglider, student and novice pilots should consider walking along the beach to the east about 150m and launching from some less overgrown although lower dunes. There is very little beach at low tide. Be careful not to catch a wingtip in the face of the dunes when scratching if the wind is light. Other than Grossard Point and Rhyll, there are currently no "official" sites on Phillip Island, although there are flyable spots on council land. No launching anywhere within the boundaries of Phillip Island Nature Park. Check the detailed map on their regulations page. Launching within the park boundary may attract a sizable fine from a Park Ranger. 90 km southeast of Melbourne via the Bass highway, just ouside San Remo. Park at the car park at the end of Potters Rd and slide under the fence, rather than climbing over. 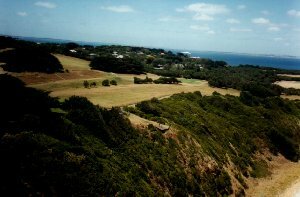 This grassy cliff is private property and the kind owner allows access as long as he is rung first (business hours): Pete Maclellan 5678 5292 or Eleanor Ross 5678 5668. This was going to be a golf course but was not completed, so there are lots of nice areas for top landing. South winds are very good. SSE is better if you want to try left, as getting back can be an issue. While the bowl is rated Supervised, going left or right out of it is Advanced. Launch from the top in 8-15 kts. There is ample beach to bomb out, with a stairway up on the left. Top landing is very good, just avoid the rotor from the large pine tree, right of launch. When the winds is crossed left or right, there is rotor at the points. 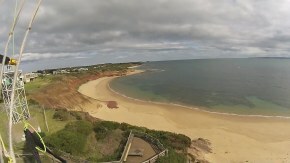 This site offers flights all the way to Kilcunda and San Remo. Watch out for the occasional hole and star picket. Low coastal cliffs. East to NNW, North is best. 10 + Knots. On Phillip Island. Drive to Phillip Island. Follow signs to Rhyll at NE of island. Park at corner of Beach Rd and Reid Street. Careful - the grass is very boggy after rain. The BOM Rhyll AWS ( Automatic Weather Station ) is at NE point. Large grassy area available from East to North. East beat very small. North is best with 2 km beat. Plenty of room for top landing. Bomb out: If there is beach, walk around to right 200 Meters and up near the yacht club. Beware of high wind gradient. Carefully gauge the wind in the high trees behind launch. Check the tides for Rhyll before going as there is no beach if the tides are more than 1.5 Meters. Walk around the cliff point on the right hand side of the beach. Launch is around the point and up on the more clear part of the cliff top. It is important to get the canopy up cleanly as launch is covered in small bushes etc that is easy to get your lines snagged in. There is a beat of up to 1km. An easy 100' to 150' above Launch and up to 500' above Launch achievable. This site can be only usually flown with a good ESE wind as takeoff is quite low and the cliff is not that steep. However once up and flying it can be quite good. For paragliders this site has a very limited range of flyable conditions. If it is windy enough to get up from the low takeoff there is a danger of being blown back once higher.